LAWRENCE — The Electrical Engineering & Computer Science Department at the University of Kansas has received approval to offer a certificate in RF Systems Engineering — a move that will strengthen the university’s ongoing partnership with Garmin International’s American headquarters in Olathe. The certificate program is open to EECS graduate students. 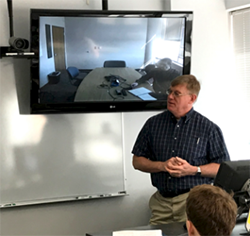 Classes in the program will also be available through a video feed to Garmin’s facilities, enabling the company’s engineers to learn about advanced RF technologies in their workplace setting. RF Systems Engineering — the “RF” stands for “radio frequency” — is a specialty at Garmin, which manufactures radios, radars and other avionics instrumentation that make it possible to fly many of the world’s aircraft. “They build the radios and other devices that go in the cockpit,” Frost said. The new program also builds upon long-established expertise of the EECS department, Frost said. The new program will enable students to obtain this certificate with an option to continue toward a master’s degree in electrical engineering at KU. Rich Simeon, a senior flight control system engineer at Garmin, said the availability of such classes helps him keep his skills sharp. In addition to facilities, the company also has an assistance program to help engineers pay for courses. "They keep the engineering workforce sharp and allow us to keep growing professionally,” he said. “Taking courses helps me recall things I might need to know on my job that I may have learned in school years ago but forgot about." Garmin also makes it easy to take advantage of the offerings, he said. "It's been really seamless for me,” Simeon said. “It's easy to go to the room, walk in and connect. It's really convenient for us." KU and Garmin have long had a mutually supportive relationship. Min Kao, through the Kao Family Foundation, established scholarships for EECS students; the department’s Min Kao Engineering Design Studio is named after the company’s founder. "We're here to support Kansas industry, and they're a major employer in Olathe,” Frost said. “They provide opportunities for our students, and we want them to be successful. We're very interested in making sure the education experience we're providing is directly relevant to Kansas industry." KU officials say the partnership with Garmin could be extended to other companies in the Kansas City region. Admission into the new certificate program is open to anyone with a bachelor's degree in electrical engineering who achieved a GPA of 3.0 or higher during their undergraduate coursework. The certificate includes required courses in radio transmission systems, antennas and microwave engineering. The certificate program comprises four courses. Participants can choose one of three electives — high-speed digital circuit design, intro to radar and microwave remote sensing — to complete the certificate requirements. “There are not very many universities in the country that have an expertise in radar systems — it's niche,” he said. “And we're one of those institutions."